My kids are sushi fanatics. Straight fanatics. We’ve been taking them to our favorite sushi restaurant that’s right around the corner from our house for a few years now and anytime we ask for input on where to go for dinner they both will ask to go there. They will use chopsticks (I picked up a set of these adorable animal trainer chopsticks for home), pour their own soy sauce from the pretty little pot, and get very interested in choosing the rolls that we order. C’s favorite involves salmon roe and A’s favorite is a tempura crunch roll – also one of my favorites! I’m half proud and half amazed at just how much sushi those two small human beings can pack into their little bodies. Well, recently C and I were brainstorming dessert ideas and we got to talking about how cool it would be to have a dessert sushi. I love the way her mind works. After some searching we realized that there are many versions of this floating around, but we wanted to make our own. 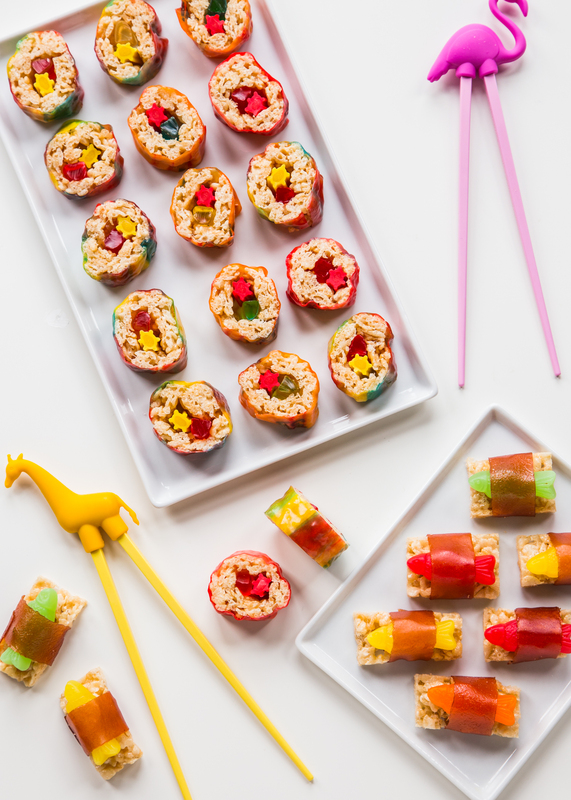 We had a ton of fun picking out candies, fruit leathers, and roll ups to use in our versions of these marshmallow treat sushi. We decided to make marshmallow treat versions of two different styles of sushi: Nigiri and Maki. Of course, the base is made from classic marshmallow treats. I used a 10.5 oz bag of Campfire® Mini Marshmallows and 5 cups of rice cereal. 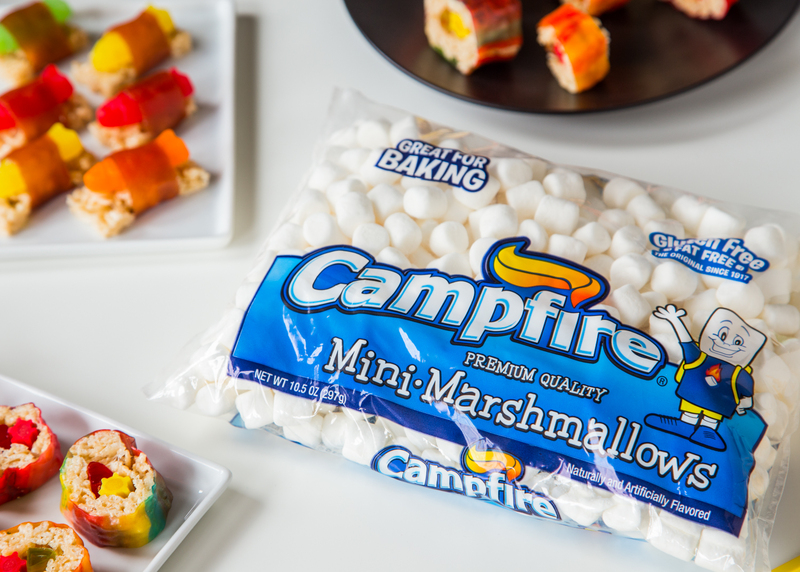 This is a ratio that is slightly higher in marshmallows than usual, but this helps keep the marshmallow treats soft and easy to roll. It also makes them a bit stickier for long term storage, but placing some sheets of wax paper between the finished rolls does wonders to keep all the finished pieces in tact. After you make the marshmallow treats, spread the mixture on a rimmed baking sheet and trim the edges to make them nice and straight. The mixture will go almost to the edges of a standard baking sheet, but not quite. The trick is keeping the final treat layer thin so that it can be rolled around the candy fillings. 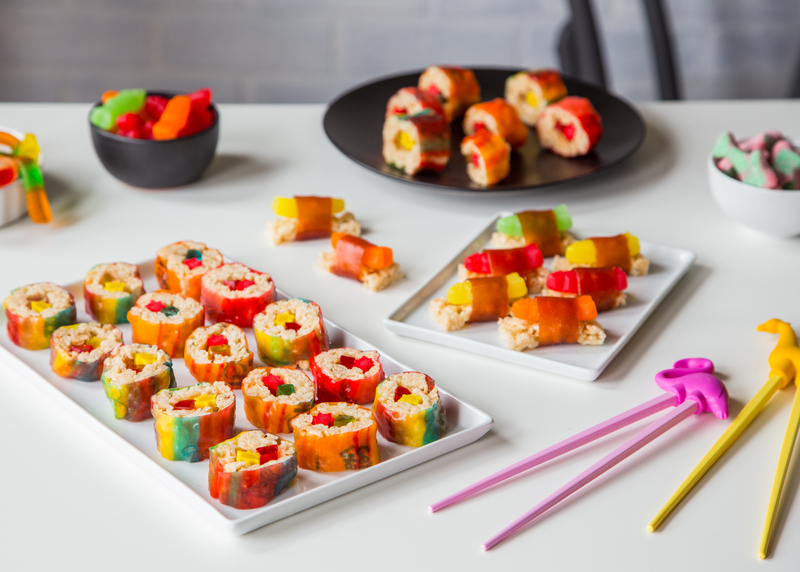 For the Nigiri style sushi, cut the marshmallow treats into small rectangles about the size of the gummy fish. 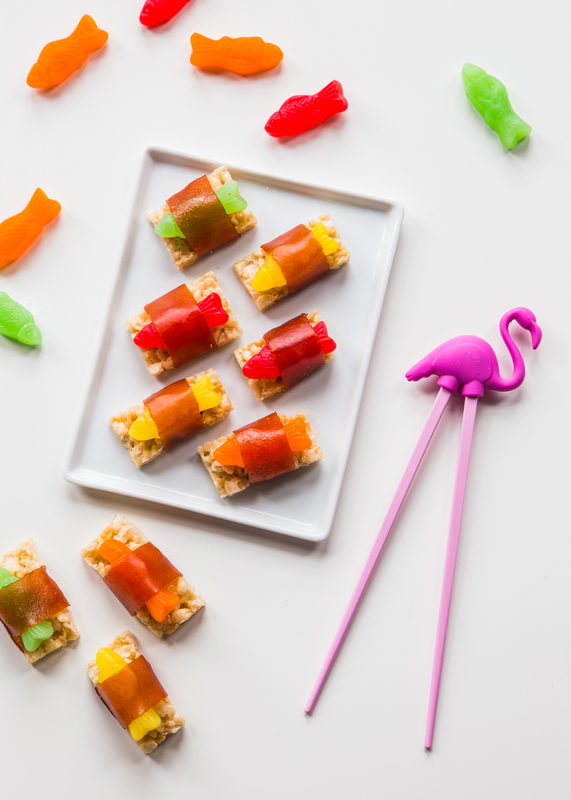 Place one gummy fish on each rectangle and wrap in a small strip of fruit leather. The Maki (rolls) are a little more complicated, but seriously, not hard at all! Place a gummy work and a licorice twist (trim it if needed) across the short end of a slab of marshmallow treat. 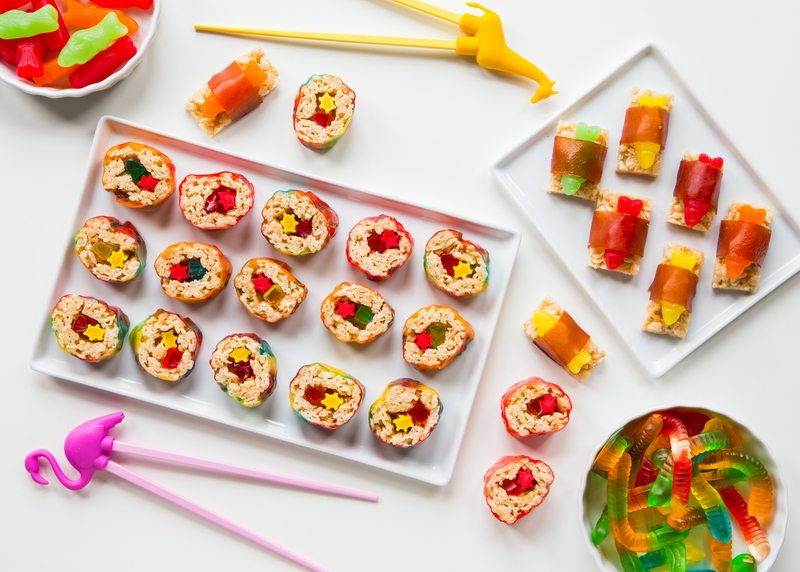 Roll the treat around the candies and trim extra marshmallow treats for another set of rolls. Use your fingers to press the marshmallow treats together and seal the edges. 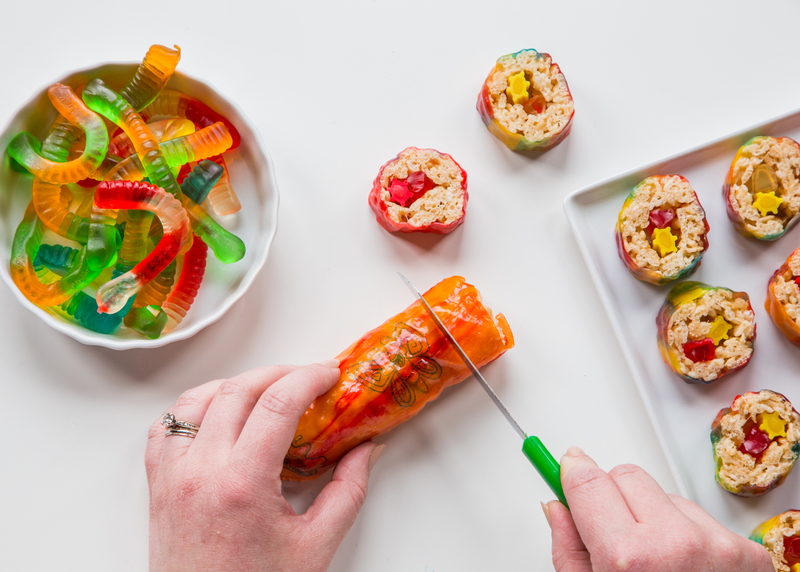 Wrap a large fruit roll around the marshmallow treat and slice! Easy peasy! C has requested that we make these for her 7th birthday party in the fall. What the lady wants, she shall have 🙂 I really just want another excuse to make these – ha! For more information on the lovely Campfire® Marshmallows visit them on their website and on Facebook, Twitter, Pinterest, and Instagram. In a large pot, melt butter over medium heat. Add marshmallows and stir until completley melted. Remove pot from heat. Add in cereal and stir utnil mxiture is evenly coated in marshmallow. Spread mixture into a thin layer onto a buttered rimmed baking sheet. Allow to cool slightly. Use a knife to trim the uneven edges of the marshmallow treats. Cut the marshmallow treats into thirds, making 3 rectangles. Cut small rectangles out of the marshmallow treats about the size of the gummy fish. Wrap a small piece of fruit leather tape around the fish and marshmallow treat. Repeat with remaining small rectangles of marshmallow treats. Lay a gummy worm and a licorice twist along the short side of one of the 3 large marshmallow treat rectangles. 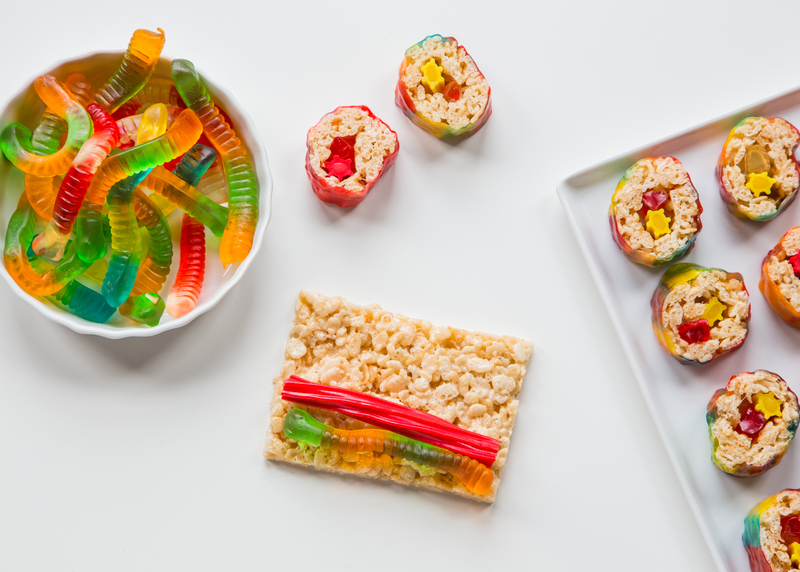 Roll marshmallow treat around the gummy worm and licorice. 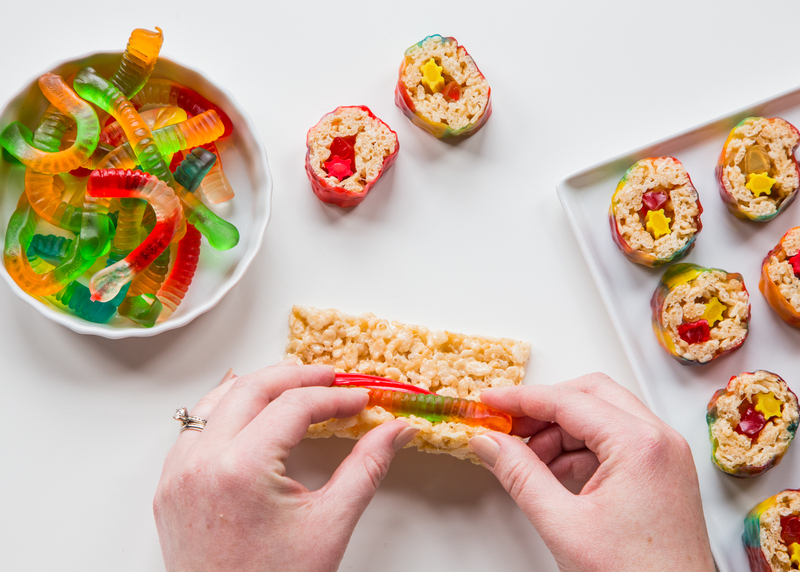 Trim extra marshmallow treat and use fingers to seal the edges around the sushi roll. 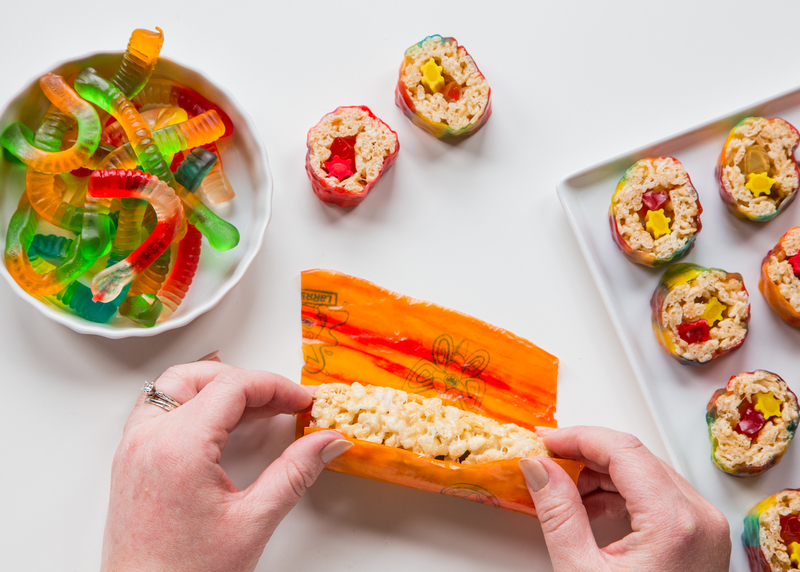 Wrap a fruit roll up around the sushi roll, pressing to seal it into place. Using a sharp knife, slice off 1 inch pieces of sushi. Store sushi in a sealed container in between layers of waxed paper for up to 2 days. ADORABLE! I love this so much – what a great and fun idea!! This is ingenius!! My kids would call me mom of the year! 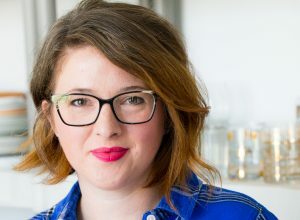 So clever Emily!